Paranormality: Hera St. Aubyn's "Undead in the City" On Sale Today! 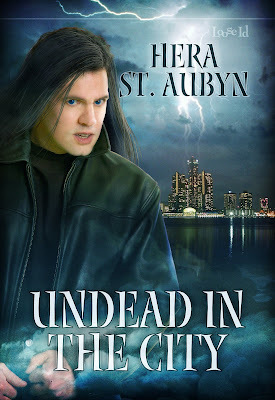 Hera St. Aubyn's "Undead in the City" On Sale Today! In my first WIP the vampires ae divided into two different groups. The friendlies and the rogues. In both cases they basically are no different then humans. They go out in the daylight, eat human food, have a shadow and reflection in a mirror and on film. You can't tell the vamps from human. The difference between the two are as follows- Friendly vamps only need blood once a week if that frequently and they can easily survive of blood from blood banks. Rogue vamps only survive on fresh human blood taken from their victim. They need to feed daily but, unless provoked, as a rule don't drain the victim.The rogues when turned by another rogue are left to fend for themselves while the friendly vamp helps the newly turned understand their new life. Who says that the Hollywood vampire is the only one you can have. That is the great thing, I, the author can make my vampires into what ever I want and no one can say that I am wrong.